In 2016 the Centers for Medicare & Medicaid Services (CMS) revised its Conditions of Participation (CoPs) to officially adopt the 2012 edition of NFPA 99: Health Care Facilities Code. NFPA 99 requires "wet procedure locations" to be provided with special protection against electric shock. Isolated Power Systems are the preferred method of achieving this protection where power interruption cannot be tolerated. NFPA 99 also clearly states that these systems are to be inspected regularly. How often should Isolated Power Panels be tested? NFPA 99 Code requires all Line Isolation Monitors (LIMs) to be tested and documented at least once every 12 months (every month for older, analog designs). NFPA 99 Code also requires that LIMs are tested after any "repair or renovation" to the system using external fault loads. PG LifeLink offers Annual Testing for all facilities using Isolated Power in all 50 states and Canada. 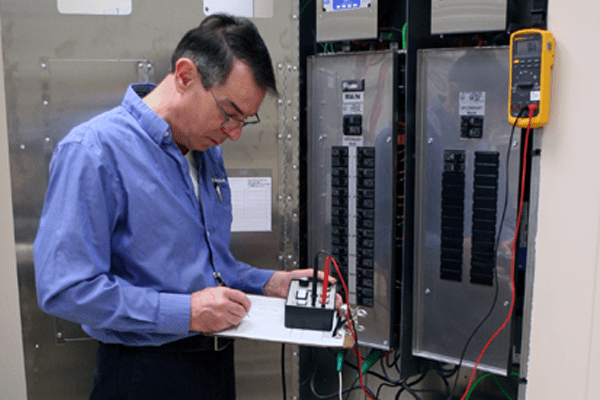 PG LifeLink’s qualified Field Service Technicians are specifically trained on all brands and models of Isolated Power Systems. Testing to cover the NFPA requirements can be performed internally by facility personnel. This type of testing provides minimal information about the health of the system. However, these basic tests do not provide the type of data necessary to spot trends and ensure that system reliability is not compromised in the future. PG LifeLink offers one and multi-year Annual Testing Contracts. The testing completed by our Field Service Technicians far surpasses the minimal requirements to remain compliant for NFPA and Joint Commission audits. Learn more by visiting Annual Testing.